Fix Sudden Error Establishing a Database Connection in WordPress By Following Our Logical Flow Chart Without Taking Much Sudden Headache. Causes of Sudden Headaches are not really great ! We are talking about fixing the typical appearance of white page declaring Error Establishing a Database Connection in WordPress all of a sudden in a five minutes ago working great website. This is not for those who could never establish a Database Connection or getting MySQL Gone Away Error. Many years ago we published an article – Tips to Optimize WordPress Running on Dedicated Server, although with time; the links or tips are not fully applicable now anymore but actually the basic issue is with resource allocation to MySQL database. Those who has no idea about SQL, MySQL, PHPMyAdmin or what type of web hosting you are using, it is better to take someone other’s help. Usually your web hosting company’s support will work fine. Do not try to experiment on trial and error basis. Usually error will go away. Reasons can be many, but usually it happens due to buggy plugins. you will be able to repair the corrupted database. It is important to double check the database details (unlikely they will be wrong – since 5 minutes ago they were working nicely). Sometime’s with wrong chmod value, deactivating W3 Total Cache like plugin can make the whole wp-config.php white – instead of deleting one single line, it fully deletes all the lines. This is why we suggest to change the ownership of wp-config.php to root instead of giving it to Apache (www-data) and chmod it to as low value as possible so that no Plugin can overwrite it. Plesk, cPanel, Webmin etc. web software usually will run normally (if installed), so as Apache, PHP. Plesk, cPanel, Webmin are more related to Perl than MySQL. GoDaddy, Bluehost etc. shared, VPS face these errors due to inadequate allocated resource. Try to upgrade to better web host which are standard now like Rackspace, Amazon, HP Cloud etc. It is not that, you’ll never get Sudden Error Establishing a Database Connection on these hosts, but actually you can allocate more resource to MySQL server or use a Database as a Service. Primarily it happens out of a protective mechanism to prevent destruction of the data saved on database. With sudden spike of increased need of RAM for MySQL (just to make it simple), MySQL Server stops to execute anything. Once you saw it, use some web software to monitor up time and ping you when the server is not working properly. Not all service will give alert for MySQL errors. This Article Has Been Shared 1050 Times! 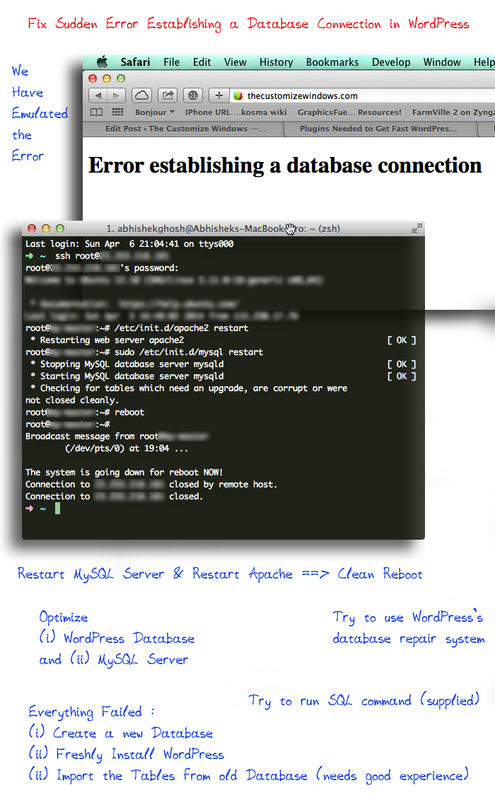 Cite this article as: Abhishek Ghosh, "Fix Sudden Error Establishing a Database Connection WordPress," in The Customize Windows, April 6, 2014, April 19, 2019, https://thecustomizewindows.com/2014/04/fix-sudden-error-establishing-database-connection-wordpress/.